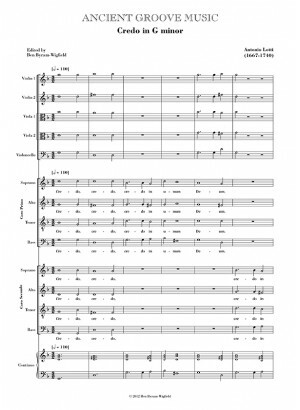 This is a large-scale setting of the Credo for double choir with string and continuo accompaniment, which is the source of the six-part Crucifixus, sometimes performed as a stand-alone motet. 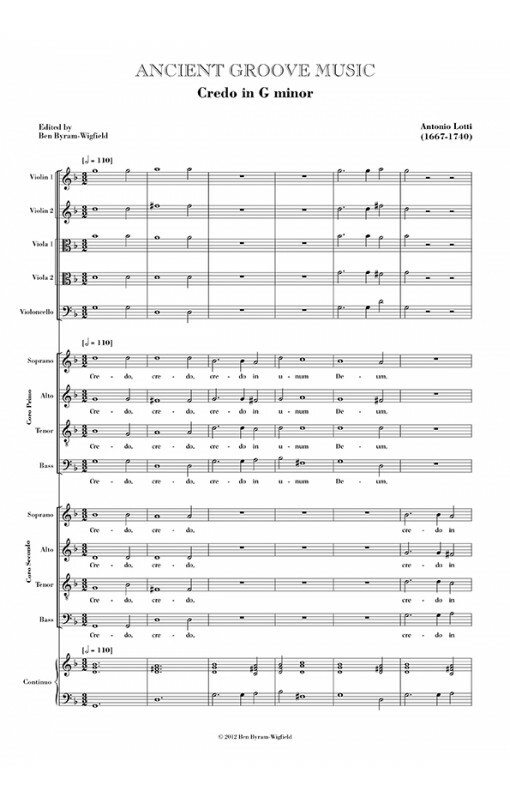 While Lotti's other Credo settings feature four-part choirs that expand into larger vocal ensembles for the Crucifixus, this setting goes the other way, starting with two SATB choirs, and then reducing to SSATTB for the Crucifixus, which is performed without strings. As with the other settings, an Adagio for Et incarnatus est and a joyous fanfare for Et resurrexit restore the music of the Crucifixus to its rightful context. The work is scored for two bass instruments: the basso continuo part and a violoncello part. Parts have been editorially created to allow a variety of bass instruments to perform the work: from one cello to a larger number.